Yesterday morning I whipped up some Cream Boston Pie Creamed by Boston Pie for our celebration supper dessert. We cheered on our Canucks at our house and enjoyed watched the last game in a wonderful series that we almost won. I've been making this easy cake that is called a pie for years. It still tastes as good as it ever did and large pieces were polished off last night in spite of us Canucks being creamed by Boston. Congratulations to the Boston Bruins on a well-played series. Vancouver Canucks we are still your fans and thank you for a great year and we'll be cheering again for you in fall! Put parchment paper at the bottom of a 9-inch springform pan or regular cake pan. Combine the flour, sugar, baking powder, baking soda and salt in a medium mixing bowl. Add the buttermilk, egg yolks, and oil and vanilla. Beat the egg whites in a separate bowl. Fold the egg whites into the batter with a spatula until combined. Pour the batter into the prepared pan and bake about 25 minutes or until toothpick tests clean. Let stand 10 minutes and then cool on a wire rack. Combine the sugar and the cornstarch and salt in a medium saucepan. Add the egg yolks and stir well. Add the milk and the cream and whisk together. Heat over medium heat, stirring often to prevent scorching. .. or cook it in the microwave until boiling. .stirring every minute. Remove from heat and cool for 15 minutes. Heat the cream over medium heat until it begins to bubble ..near boil. Remove from heat and add the chocolate chips and stir until smooth. Slice the cake in half as shown. Pour a bit of custard over the bottom layer and let sit for awhile to set add more when you can see it won't run over the sides. .the custard will have to be just slightly warm or even cooler for it not to run over. Put the top layer over the custard. Can I lick the bowl the next time?I agree with Sonya, that looks sooooooo good! Oh this looks amazing!! Thanks so much for sharing the recipe! Would you please tell me what oil you use in your cake...I used to use canola oil all the time but now everyone says that it's bad for you....something tells me that olive oil wouldn't be good for a cake...but I'm not a big baker anymore so I don't really know...I enjoy your blog very much and the food you show us looks very delicious! Creative and oh so appropriate name for your pie! I was cheering for Vancouver and was sad to see them lose. But I'm happy for Boston that they get to enjoy the victory! Thanks for all the great recopies! I made the tex mex burgers for supper a couple of nights ago and we loved them! And I don't even like burgers! Thanks for all the encouragement and great ideas! My husband's favorite dessert is Boston Cream, will have to give it a try. Being from the Boston area we were happy with the Bruin's win, but I always feel bad for the other team as it must be such a disappointment. Hoping Vancouver can win next year! I was so distressed to see that there were riots too after the game, I hope all Canadians are okay and the fans will control themselves. My Dad is French-Canadian so we have a love for CA. ooh, what creamy goodness you have here!! This had me laughing this morning :). The rest of my household feels the same way this morning. My husband is a big Canucks fan, and all 4 of our children. Maybe I won't make them a "Creamed by Boston Pie", but I'm sure by son they will be ready for a "Cream Boston Pie"! Thanks! I use Canola Oil. I think you could probably use a extra light olive oil in this and it would be fine. Oh Lovella, this pie looks delicious..creamed or not:) Great post! it has a light taste and is a healthy choice oil. Delicious! What a good sport! lovella...glad you posted this recipe. Lovella, your pictures look good enough to eat. We also had a Creamed by Boston Pie last night. It was the first time I ever made it - in preparation for the big win... but it was still good, even re-named! It was too bad about the riots... like somone said, worse than losing the game. Secondofwett - Canola oil is one of the better oils to use for baking. If you want an oil free version, you can use the cake batter for the recipe for old fashioned jelly roll (under cakes and frostings)- using greased wax paper as a liner or well greased and floured spring form pan. Sorry you lost but you're such a good sport!!! Love your sense of humor. Thanks so much for all the oil suggestions...I appreciate it muchly! I have a thyroid condition and have been told to stay away from canola...very difficult to do since it's in everything! Great choice of name! :) Thanks for the laugh about our loss! Our time will come...someday! 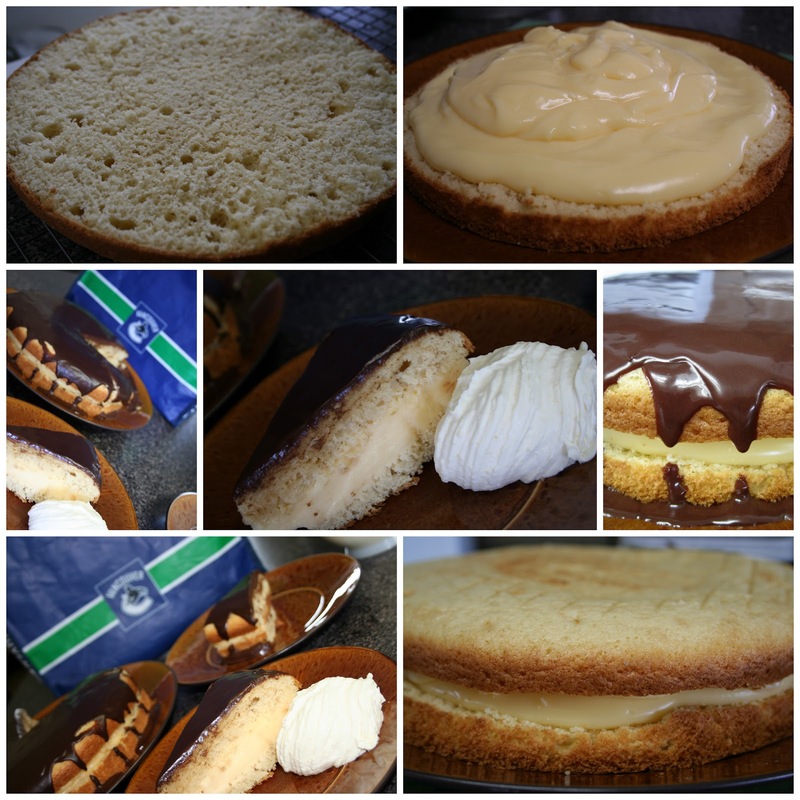 The cake looks so yummy, I'll make it for my Dad for fathers day he loves anything Boston Cream! Yes it was a great series Canucks. You'll get it next time! And we are STILL cheering for you!! I wish I was eating a piece of this right now!!! Oh. Dear. Me!! THAT looks like something we would *love* around here! Thanks for sharing.